Khampinh Xaiyakosy, age 64, passed away January 26, 2019. 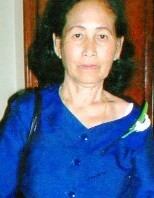 Member of Wat Lao Buddhamamakaram Buddhist Temple. Preceded in death by father, Tahn Chantalasuk and mother, Gong Chantalasuk; and brothers, Som Pom Chantalasuk and Foy Chantalasuk. Survived by husband, Vongphet Xaiyakosy; daughters, Phoutsavanh Xaiyakosy and Malivan Xaiyakosy; son, Andrew Xaiyakosy; sisters, Tong Baong Chantalasuk and Vatsana Chantalasuk; brother, Pan Chantalasuk; grandchildren, Elease Worthy, Aubree Xaiyakosy-Ingram, and Leo Xaiyakosy-Singleton; three nieces and one nephew; and many friends. Service will be held at 1:00 P.M., Saturday, February 2, 2019 at Cook & Son-Pallay Funeral Home, 1631 Parsons Avenue.